In light of Kathy Griffin’s latest ill-advised photo shoot of her posing with a fake decapitated head with signature Trump hair-style, several debates and questions have arisen concerning ‘hate speech’ in this country, and whether or not it can be criminalized. First – in the United States of America, there is absolutely no ‘hate speech’ exception to the First Amendment. This country is unique in that the right to free speech is one of the most important and fiercely protected Constitutional rights. Other countries, like the United Kingdom, do allow crimes to be prosecuted on the basis of words. (Or images). That’s why you get so many crazies on your Facebook news feed spouting off horribly racist things and why we have such a variety of ‘news’ shows on YouTube. The exceptions to the First Amendment are few: ‘fighting words’ are not protected. Fighting words are words designed to incite a fight, and are typically face-to-face personal insults directed at a specific person. But these words are not always racial or religious abuse – and sometimes it doesn’t even cover these kinds of statements. Take the R.A.V. v. City of St. Paul case before the Supreme Court, for example. The city tried to punish fighting words that were bigoted in nature, and SCOTUS held that this would be constitutional, even though a broad ban on all fighting words is permissible. Another exception is actual, true threats, or words that are likely to incite imminent illegal conduct. Such as threatening to kill someone because he’s gay or Muslim, or intentionally inciting others to harm someone because they are Jewish or white. However, under no circumstances is it ‘hate speech;’ – it’s just because it’s illegal to make these kinds of threats of violence. 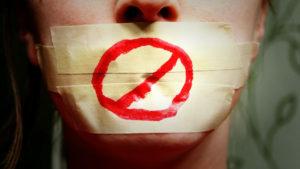 Other kinds of speech are unprotected, such as libel or defamatory speech, or anything that is obscene (a discussion warranted for another time). With that said, some actions that have an element of hate in them are crimes and carry heightened penalties – hate crimes. Lately there has been an increase in reported hate crimes – up 67% against Muslim Americans in 2015. Hate crimes are traditional offenses with an added element of bias (usually motivated by race, religion, disability, sexual orientation, ethnicity, gender or gender identity). As with the examples above, hate crimes are already a crime. The element of hate is simply an aggravating factor that often affects the sentencing of the crime. The structure as it is now punishes bad behavior better than bad beliefs. The physical intimidation or assault is punished, and the hate element is simply an aggravating factor. After all, we do not live in an Orwellian world (yet), so not only are thought crimes nonexistent, they are pretty hard to regulate. Kathy Griffin waving a disembodied prop of a Trump-esque head might be hateful, but it’s completely protected. As with anything, the devil is in the details. Introducing a hate speech exception into the First Amendment would be no different. It would involve an examination into the kinds of speech deemed ‘hateful.’ What perspectives and opinions does the government have an interest in suppressing and limiting? What points of views should be protected? How on earth are judges supposed to distinguish the two? America was founded upon the notions of free speech, free debate, and using parody (even if it’s shocking and offensive) to make a point. Trying to whittle that down into ‘acceptable’ points of view in the melting pot of society would be not only impossible, but would probably result in some pretty heated debates on its own.